Learn how to maintain your strength and energy levels in get-ripped mode, then try this program to help you stay strong and look the part! There's nothing quite like the "I did it!" boost of confidence when you look at yourself in the mirror and realize you're as lean and ripped as you've ever been. Somehow, you actually look bigger, even though all the numbers say you're smaller. Yet, the process of achieving that condition has its downsides as well. For one, most individuals see a big drop in their strength, and flagging energy levels make familiar workouts seem more difficult. You may assume that's just a necessary trade-off, but is it? Two MuscleTech athletes, Shawn Russell and Lindi Carter, have survived and thrived during many a cutting phase, and they're here to attest you can get lean while retaining your strength. Here's how they do it! Losing some muscular size during a cut is pretty much inevitable, but strength doesn't have to be. That's an important distinction, and it's best achieved by following a plan structured around maintaining strength in the four major barbell lifts: bench press, overhead press, squat, and deadlift. Focus on one per workout, and perform it first in your lineup, when your energy levels are highest. Use the most demanding weights. During those lifts, take 2- to 3-minute rest intervals between sets so you're fully recovered before your next working set. Perform push-ups between sets on lower-body days. Perform bodyweight squats between sets on upper-body days. Superset movements, using dropsets to train past failure. 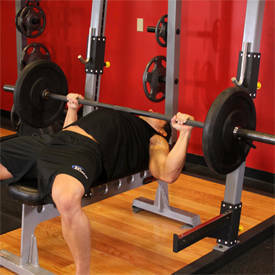 Add cluster sets: Choose your 12RM and do sets of 5 reps, resting 15-seconds between sets. Continue in this manner for 4-5 minutes. All of these techniques allow you to do more work in less time and raise your metabolism so you burn more calories both during and after your training session. Nothing will sabotage your strength faster than switching to a purely high-rep scheme in the name of burning more calories. Maintaining strength requires you to apply the right training stimulus, and that means well-intentioned sets of 15-20 need to disappear for a while. 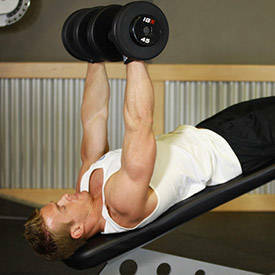 "While in cutting mode, after a proper warm-up, perform few working sets that go higher than 10 reps," Russell suggests. 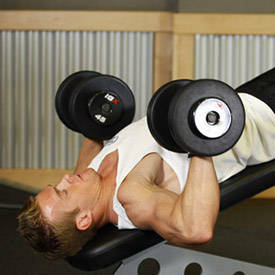 "Don't exhaust yourself doing 3 sets with a high rep count, because your strength will fall off. 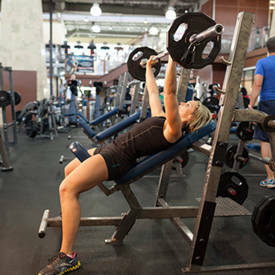 If you want to do more sets, add 3-4 sets of only 2-3 reps apiece." 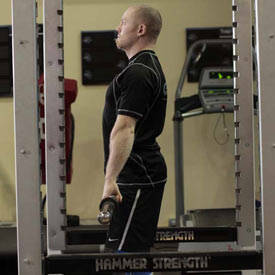 The heavy weight, Russell argues, ensures the body part is still getting the strength stimulus. This is when a spotter is worth his or her weight in gold. "You don't want someone who doesn't have a damned clue spotting you and messing up your focus, ruining your sets...especially for the big four lifts," he says. Russell recommends using a spotter on the last couple of sets for the day's heaviest lifts. Make sure you trust your support system and that they know the rules of a good spot. "Typically during the offseason, I rarely ever step on a cardio machine," Carter admits. "I personally like to save it for when I really need it. My body responds more quickly when it isn't a staple in my routine year-round. When I'm doing cardio, I switch between high-intensity interval training (HIIT) cardio and steady-pace cardio." But just as important as how you cycle cardio is how you schedule it while cutting. You definitely don't want your legs to feel cooked from yesterday's Airdyne sprints while you're trying to power out of the bottom of a squat! 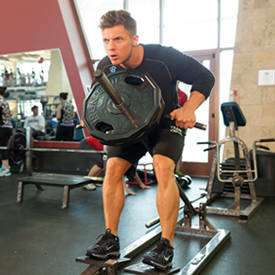 HIIT cardio, which can help keep your metabolism elevated long after your workout, is especially beneficial if your next lifting session involves upper-body musculature, as it won't interfere with muscle glycogen stores. Conversely, stick to lower-intensity steady-state cardio if your next weight workout involves the lower body. Carbohydrates are one of the first macros you're likely to significantly reduce when following a calorie-reduction diet to get lean, but it's important to target the right kinds of carbs. Complex carbohydrates like whole grains and starches have a longer molecular structure and take more time to digest, which helps to better stabilize blood-sugar levels. They're also important for replenishing spent muscle glycogen stores, which help you power through a workout. "Sugary foods have a higher chance of being stored as body fat, because they quickly raise insulin levels," Russell says. "Foods like cereal, cakes, ice cream, soda, and refined grains like white bread and white rice can spike insulin." Save your higher-glycemic carbs for before and after workouts, or for phases where you're trying to gain size. If your fat-loss efforts have stalled, be careful about further drastic cuts in carbohydrate intake; you want to have enough energy in store to feel strong going into every workout. This is where carb-cycling can be especially effective, limiting them on some days—especially rest days—and increasing them on days with demanding workouts. The Next Generation Of Weight Loss! Go Now! Both Russell and Carter keep their stacks simple while cutting, focusing on supplements that can help minimize muscle loss, maintain strength, and help chip away at fat stores. 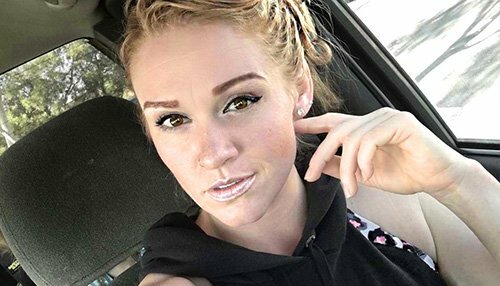 "I use HydroxyCut before my fasted cardio to help boost my metabolic rate and give me a little more energy, then during cardio I sip on After Build to help protect my muscles," Carter says. "During a calorie-reduction phase, protein consumption becomes even more important, so I include at least one serving of whey protein each day. Then, with my first actual meal, I take the HMB product Clear Muscle, which helps with protein synthesis and keeps my body functioning in an anabolic state." When you're training hard and depleting your system, your body is under an extreme amount of stress, which is what makes supplementation so potentially valuable. "You need to help fill in the gaps during that process, ensuring your body is working at peak performance," Carter says. Immediately after the main lift, you'll include one assistance exercise in the 5- to 8-rep range, also never taken to muscle failure. After that strength work, you'll increase the density of your training using supersets, dropsets, cluster sets, and cardio-acceleration techniques. Throughout these movements, you'll work closer to muscle failure. Feel free on this half of your workout to explore different exercises and try alternate techniques so you're not always repeating the same workout. Sets below do not include warm-up sets. Perform as may warmup sets as needed, but never take them close to muscle failure. Todd Bumgardner, MS, CSCS, and Bill Geiger, senior content editor at Bodybuilding.com, collaborated to create this workout. 3 sets of 45 sec. AMRAP, rest 30 sec. Using your 12RM, do max reps, rest for 15 sec., repeat for 4 min. Note: Use a wide grip on a lat bar. Note: Use a rope with both arms simultaneously.